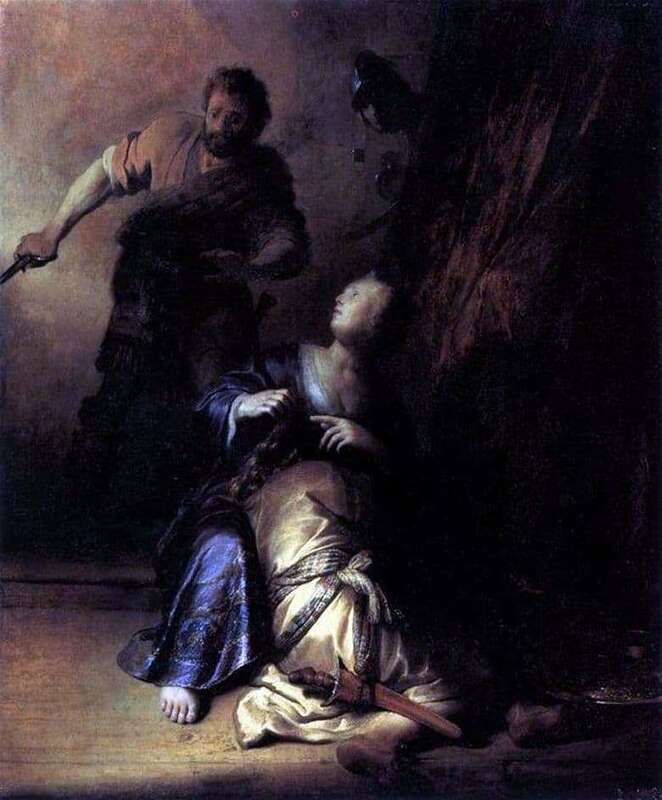 The story of Samson and Delilah is described in the Old Testament. According to legend, Samson was chosen by God in order to protect the Jewish people from his worst enemies. For this, he bestowed upon the infant a great power imprisoned in his hair. Thanks to him, Samson was an incredibly strong and resistant warrior. However, some time later, the young man met the beautiful Delilah and fell madly in love with her. The girl was a priestess of love, so Samson increasingly came to her. Several Philistine rulers learned about Samson’s obsession and offered the girl 100 coins to reveal to them the secret of Samson’s power. The greedy girl agreed to the deal. The man shared his secret with his girlfriend, and she in turn told her to the Philistine soldiers. However, at the end of the story, Samson managed to regain his strength and destroy his enemies. The canvas depicts a scene where Samson is sleeping on his lover’s lap, unaware of the betrayal that the woman has committed. The warrior is the most motionless and calm element of the picture, while the surrounding characters are in action and anxiety. Their cunning plans can break off if the victim wakes up. Therefore, the face of a warrior, cutting off the hair, expresses a strong anxiety, and the light is directed at his right hand. Creating an emphasis on this part allows the viewer to think about the intentions of the character. Delilah herself is depicted extremely worried, she points her finger at Samson’s hair, which must be cut. The left side shows a man with a sword, who is in a hurry to cut off the hair of a man. Behind the fabric screen in front of which Delilah sits, one can see a dark figure of a Philistine soldier who is watching what is happening. He is waiting for the moment when the forces of Samson weaken in order to strike the enemy at the right moment, for this he prepared a sword in advance. The warrior’s face is darkened, so the artist conveys his dark intentions and some impersonality.